Sound and speak like a native. 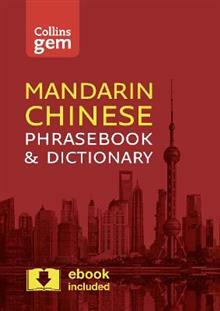 Collins Gem Mandarin Phrasebook & Dictionary is ideal for practising pronunciation, listening comprehension and becoming more confident, not just in speaking but in understanding others when abroad. The Mandarin Gem will give you the right word at t... read full description below. Sound and speak like a native. 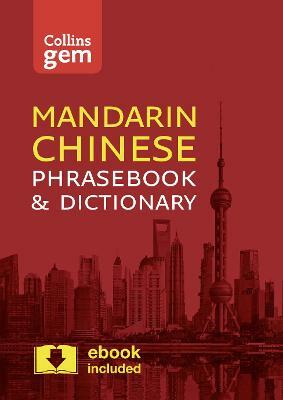 Collins Gem Mandarin Phrasebook & Dictionary is ideal for practising pronunciation, listening comprehension and becoming more confident, not just in speaking but in understanding others when abroad. The Mandarin Gem will give you the right word at the right time - every time. In all of the most common travel situations, you need the reassurance that you can communicate with ease. A reliable, portable and easy-to-use phrasebook is a travel essential, and with Collins Gem Mandarin Phrasebook and Dictionary, the right word will always be at your fingertips. This indispensable language guide covers the topics and phrases that crop up every day on holiday, from finding a hotel and setting up your wifi, to going shopping. Includes: o Travel information and tips o 3000 word dictionary o Comprehensive menu decoder o Grammar and pronunciation sections o Face to face key conversation phrases With the help of Gem Mandarin you will never be lost for words again. Amazon customer reviews of Collins Gem Phrasebooks: They are easily navigable with colour coding for different sections. My favourite bit, though - which I couldn't do without - is the awesome menu reader! They're really discreet for bringing out at the dinner table, pretty much fitting in your hand, and avoiding the truly obvious tourist look! Ideal as a quick reference guide split in to logical topics. The pronunciation support really helps too. I have managed to string a few words together already and have been understood. Much smaller than the usual Berlitz guides but equally useful.